Besides tacking, gybing is one of the sailing manoevres you'll use the most. Keeping more speed than when tacking, gybing is another method of turning. Gybing turns the boat by taking the stern of the boat through the wind (as opposed to tacking, which takes the bow of the boat through the wind, slowing it down). Because the speed is maintained (and sometimes increased) during a gybe, there is a higher risk of capsize, and also injury; the gybing manoevre can happen more suddenly and violently, and sometimes unpredictably, since you don't always know the exact moment the wind will take the boom overhead, and if you don't sail enough off of straight downwind, it can see-saw back and forth. For this reason, it's best to practise gybing on a training run, safely away from dead downwind. 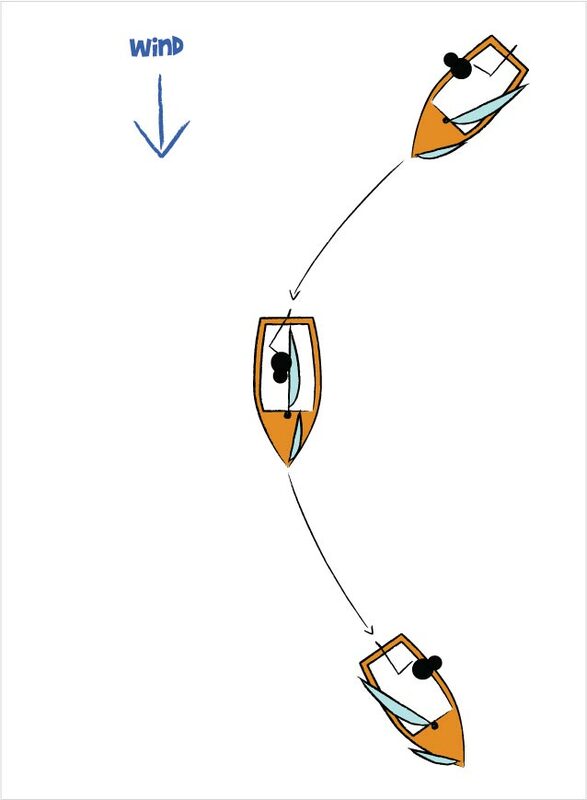 Another way of making this maneovre safer is if possible, sheet in the mainsail towards the centreline (pull in the mainsheet until the mainsail and boom move in); this way, when it snaps from one side to the other, there is less distance for it to move, less momentum for it to gain, and less damage it can do. This is particularly relevant when gybing around a mark (buoy). The instructions which follow are specifically for when sailing boats without a spinnaker; there are additional steps when sailing a boat with a symmetrical or assymmetrical spinnaker, and we will cover this in a later article. The basis and position for starting a gybe is the same in either centre- or aft main boats. The manoevre is ultimately started with the hands in the normal sailing position. Luff up (head up towards the wind) slightly from a dead run into a training run, and have the crew check the area you will be sailing into, by calling "Standing By to Gybe". The crew at this point checks the course, ensures the centreboard is a quarter of the way down, and calls "Ready". These are the steps to go through when gybing in an aft main boat, such as an Enterprise, GP14 or Mirror. 1. Start the maneovre with your hands in the normal sailing position, depending on whether you are sailing a centre main or aft main boat. If you are sailing on a dead run (hint, your sails may be goosewinged), then change your course slightly more towards the wind, to move into a training run. 2. Check the area you're sailing into and ensure it's clear. Next, call out "standing by to gybe", assuming you have a crew of course! It's their responsibility to double check the boat is clear to gybe and the area you are sailing into is clear, then they should drop the centreboard by a quarter (to give the boat some degree of stability), and call "ready". If you have no crew, then carry out those parts yourself. 3. Change your hands over on the tiller and mainsheet, much like when tacking, using the same Trap and Change routine (but don't Push the tiller away from you!). 4. Put your front foot forward into the middle of the boat, and pull the tiller towards you; swing the tiller extension to leeward (towards the side the mainsail is on), and push the tiller to windward (the side you are on). As you carry out the gybe maneovre, call out "Gybe-Oh!". 5. Ducking down, pivot on your feet into the middle of the boat, facing backwards, as the mainsail swings across over your head. Watch out, as this can be sudden and sharp. 6. As the boom reaches the centreline of the boat, centre the tiller quickly, swing yourself across the boat and take up your new position on the other side of the boat quickly. The crew should also move to balance the boat as necessary, and adjust the jib as necessary. 7. When the boat is trimmed and balanced correctly, set a new course and sail on. - Gybe facing the back of the boat. These are the steps to go through when gybing in a centre main boat, such as any new Laser, Topper or RS type dinghy. 3. Leave your hands as they are - you change them AFTER the maneovre for centre-main boats. Move your backfoot to the middle of the boat, and pull the tiller towards you; swing the tiller extension to leeward (towards the side the mainsail is on), and push the tiller to windward (the side you are on). As you carry out the gybe maneovre, call out "Gybe-Oh!". 4. Bear away more (pull the tiller extension more towards the side you are on), and move to the middle of the boat as the boom starts moving. Centre the tiller as the boom reaches the centreline of the boat (remembering to duck), and then move your weight to the new side. The crew should balance as necessary, and trim the jib. 5. Once you are confortable in the new direction in which the boat is sailing in, now you should get your hands sorted out - the tiller extension should right now be behind you, and the mainsheet in front of you; bring the rope across the front of the body towards the tiller (rather than bringing the tiller to the rope which will alter your course). Change hands over using a Trap-Change routine, and then bring the rope back across the front of the body. Your hands are now corrected. IMPORTANT: DO NOT change your hands until you are on your new course, and sailing along. You can sail along for quite a distance with your hand behind your back sailing, when you are comfortable, then change over. Also, make sure you change over hands, bring the rope hand back through, and then, swing the tiller under your arm to bring it through. If you bring them through at the same time, there is a chance you'll get all snagged and tangled up. Also, make sure you change over hands, bring the rope hand back through, and then, swing the tiller under your arm to bring it through. If you bring them through at the same time, there is a chance you'll get all snagged and tangled up. 6. When the boat is trimmed and balanced correctly, set a new course and sail on. - Gybe facing the front of the boat. Gybing is one of the more dangerous manoevres, but if you follow the steps above you should be able to carry it out in a safe manner. One other pitfall to watch out for is deathrolling; this happens particularly easy when you are goosewinged on a dead run, before gybing. If the wind makes the boat rock from side to side, this will amplify very quickly, the rocking motion will increase, eventually resulting in the boom digging in the water, slowing the boat quickly, and more often than not resulting in a capsize.